Ellie Ga, Measuring the Circle, 2013–14, single-channel split-screen video, color, sound, 21 minutes 45 seconds. This exhibition, curated by Béatrice Gross, assesses the relationship between text and image in contemporary art. The mysterious collective Slavs and Tatars’ Eurasian patterns, Ellie Ga’s video archaeology, Robert Stadler’s sculptural curiosities, and Erica Baum and Julien Bismuth’s photographs are just some of the works that come together to reflect multiple historical, cultural, and linguistic interactions untroubled by the pieces’ ineradicable traces of difference. Slavs and Tatars’ four-piece fabric-and-paper series “The Inrising,” 2017, features glorious mythical phoenixes parading across bright abstract patterns. Gina Pane’s Souvenir enroulé d’un matin bleu (Rolled Memory of a Blue Morning), 1969, is a felt-shrouded wood-and-aluminum handle that hangs on the wall like a piece of somber gymnastics equipment. Dangling nearby is Stadler’s wood, foam, synthetic textile, and steel sculpture Pentaphone, 2006—a piece that falls somewhere between modernist lampshade and virtual-reality simulator. All these works defy the boundaries between art and design. Elsewhere, Baum’s photographic prints transform old newspaper clippings, collaging words and signs into conventional flower and landscape pictures, while Bismuth’s distorted photographs of a sun-beaten Amazonian home conceal hidden messages, embodying the difficulty of representation. The centerpiece of the show, Ga’s magnificent single-channel video split across two screens, Measuring the Circle, 2013–14, reconstructs the history of a lost ancient wonder: the Great Lighthouse of Alexandria, destroyed by an earthquake in the Middle Ages. 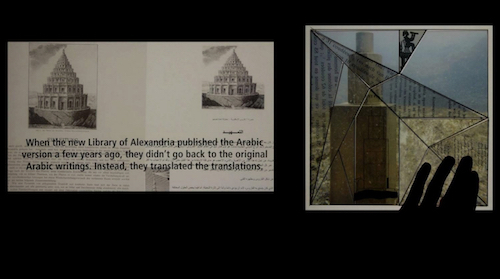 Sifting through a labyrinthine array of sources, from shaky footage of the contemporary Egyptian city, antiquarian illustrations, and handmade transparent puzzles of archival documents, the artist searches for what the lighthouse once looked like. With each book, diagram, or story, the ever-receding horizon of truth eludes Ga’s grasp; like a relentless time-traveling detective, she scrambles through the rubble of Greek, Roman, and Ottoman Empires, the video a palimpsest etched on absent originals.